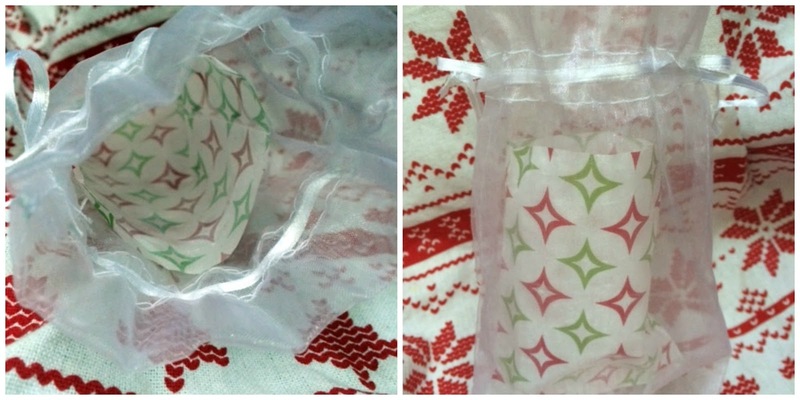 A Christmas Ornament Exchange and a bit of Trickery! My first ornament exchange was full of trickery! The imposter was Vicky from "Life on Willie Mae Lane". She was also the one who coordinated this amazing exchange and sent me my parcel! My package went out to Linda from A LA CARTE and I now have a new friend. She is a creative inspiration to me and you should RUN and check her out! Thanks Vicky for this new friend and a fun exchange!! It was exciting from the get go. I received an email from Vicky telling me that my parcel would be late! The person who got my name was waiting on an item before she could send it out! I think I had a banner across my head that read "SUCKER!" Yep I fell for it! You gotta get up pretty early to fool a turtle.....What time do you get up Vicky? Off to the post office I ventured. The post office worker informed me that I couldn't open this huge parcel until Christmas......but I had to blog on the 13th???? She insisted....DECEMBER 25th. She tried to keep the parcel but I wrestled her down to the ground, grabbed my package and darted out the door. Off to my sisters to unwrap the parcel.....again another wrestling match, this time with a fur baby. Not even a hundred pound dog! AND I MEAN MY BIG BOX OF TREASURES!! 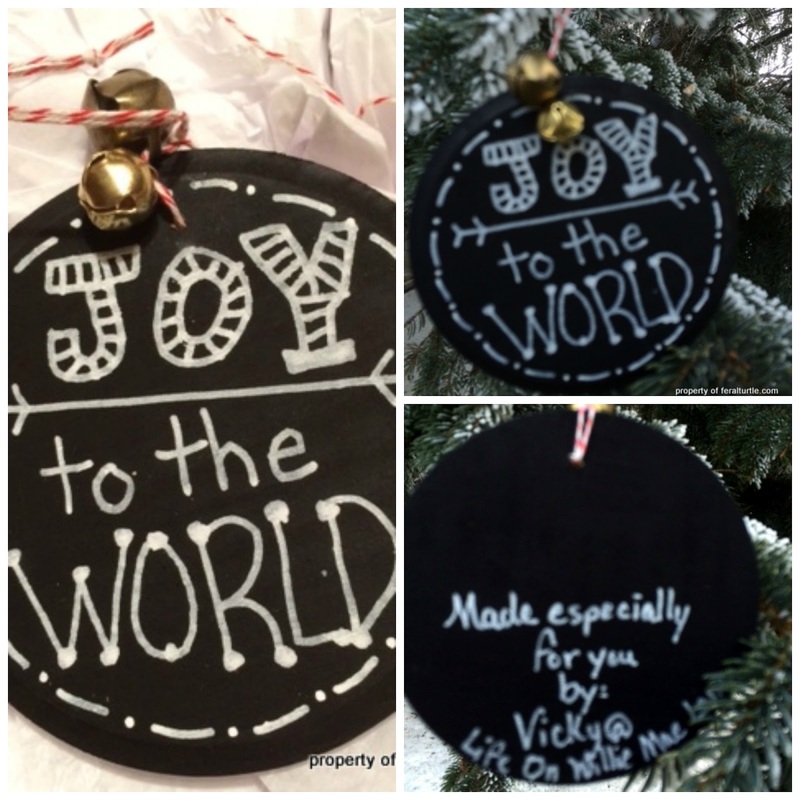 I LOVE HANDMADE ORNAMENTS....Look how cute these are! This is just pure genius! A plastic wineglass with the base removed becomes a cloche! So beautiful. Sorry for the blurry picture. I had to drink the wine and then try to shoot. Easier said than done. 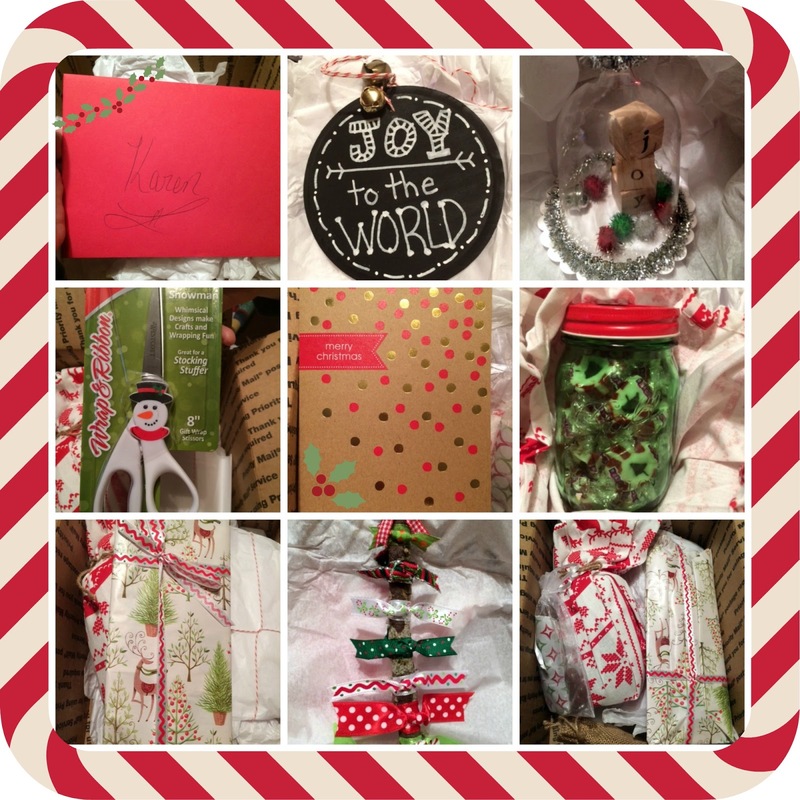 A beautiful Christmas towel and yummy yummy chewy mint candies in a cute tinted jar complete with a Christmas lid. 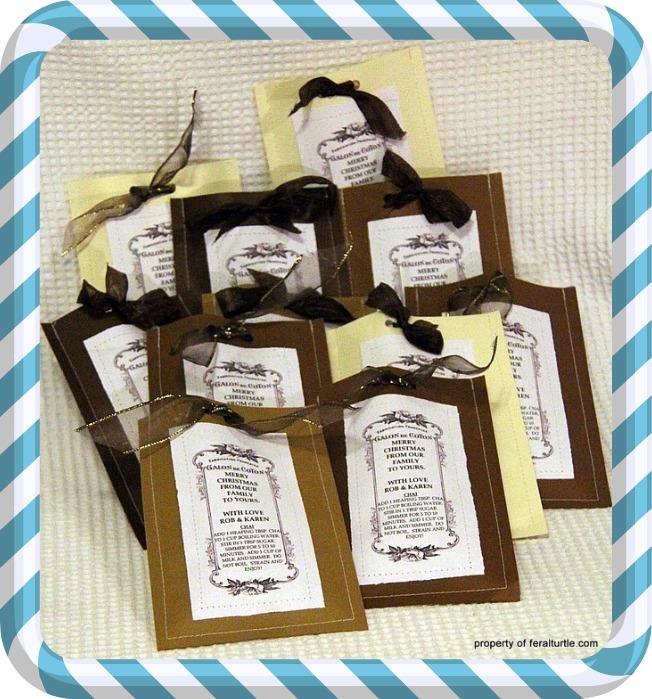 In the hand stamped burlap bag, was the gorgeous handcrafted clay ornament. HMMMMM I wonder what was in there. I didn't see anything...it was empty....are there refills? These little gems caused the delay of shipping the package. I say, "What little gems?" I think that innocent looking snowman ate all my goodies! He's not just another pretty face. So thoughtful and so much fun!